Bryant Woods Montessori Children’s House is a Montessori School in Columbia MD. We were established at the time of the city of Columbia’s founding in 1969. 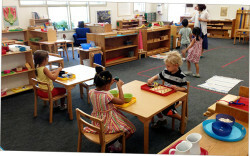 Looking for a private school or Montessori School in Columbia MD? We are among the oldest in the area and our school parents say that we’re the best! Our current staff comprises two full time Montessori Directresses, one part-time Classroom Aide and an Executive Director. At a minimum, both Directresses hold Montessori certificates (AMS or AMI) and a bachelor’s degree. Please view our staff page for more in depth information about our staff. We have a classroom capacity of 28 students. During all three of our sessions (Morning Half-Day, Afternoon Half-Day, Full Day), we have two Montessori certified teachers and one classroom assistant. As a result, a wide range of support is provided to the classroom. Our Montessori school in Columbia MD is accredited with the American Montessori Society and the Middle States Association of Colleges and Schools. We hold a Maryland State Board of Education Certificate. Our Kindergarten program is certified by the Maryland State Department of Education. Additionally, we are also a member of the Montessori Schools of Maryland. Full Day session: 8:45 AM – 3:45 PM, includes lunch and lightly structured group socialization activities from 11:45 to 12:45 and is available to the 4-6 year olds. Bryant Woods Montessori School in Columbia MD is an independent, non-profit school that is committed to educating the 3 to 6 year old child from diverse backgrounds. Our school promotes joy in learning and positive character development. We also focus on stimulating the intellectual, emotional, physical and social growth of the child through the implementation of the Montessori philosophy. Furthermore, we strive to promote the development of initiative, independence, responsibility, curiosity, cooperation and respect for self and others. The Board of Trustees, consisting of community members and current parents, is responsible for the policies and overall financial management of our Montessori school in Columbia MD. The Executive Director implements the policies and is responsible for the overall daily operation of the school. The Parents Guild is the school’s parent association that works to build a sense of community for the school (i.e. : events, fundraising, and service projects). Please see the Parent’s Page for more information on our Parents Guild.